The battle of the observation deck attractions continues as new information is revealed about possible improvements to the Willis Tower’s Skydeck. The battle of the observation deck attractions continues as new information was revealed about possible improvements to the Willis Tower’s Skydeck. Following last month’s unveiling of a $500-million plan to upgrade the tower, which includes major improvements to its base, it is no surprise that the top of the tower would get some love too. 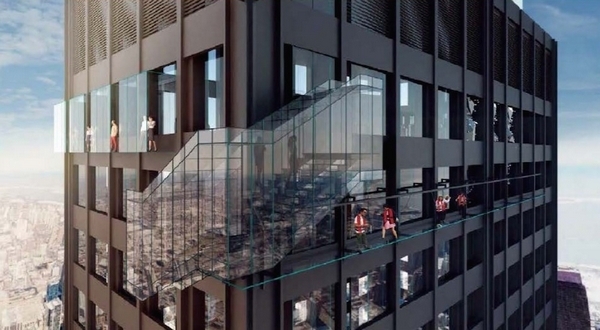 Following the major success of the Skydeck’s “Ledge” attraction, a set of glass boxes suspended off the side of the building, the new plans include even more high-flying theatrics. One of the new attractions would allow for guests to descend from the 103rd floor to the 102nd floor by rope in a glass enclosure on the side of the building. Another, called the “Ledgewalk,” would allow guests to walk along a glass ledge cantilevered off the side of the building. The rendering also includes a new glassed-in staircase attached to the corner of the building. The new attractions were revealed in a report by Morningstar Credit Rating. They would be part of a $20 million overhaul of the Skydeck which would include expanding the observation deck to accommodate double its current 600 guest capacity. The 102nd floor would be added to the space, which currently is contained completely on the 103rd floor. The Skydeck is in direct competition with the John Hancock Center’s 360 Chicago observation deck that includes the "Tilt" attraction, which suspends guest face-first over the side of the building. The attractions also are reminiscent of the Los Angeles’s US Bank Tower’s “Skyslide,” which lets guest slip from the 70th floor to the 69th. It would seem that Blackstone, the Willis Tower’s owner, is betting that the annual 1.5 million guests might be just as interested in being terrified as they are getting a good view. 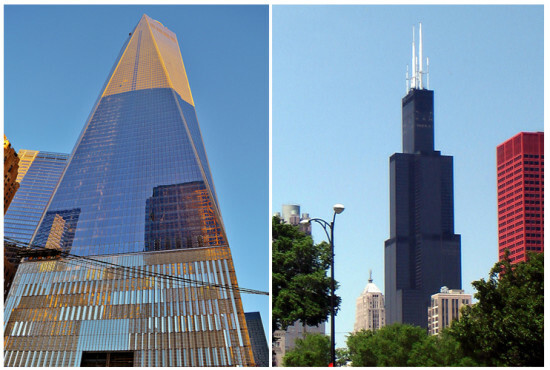 Plans have been revealed for a $500 million renovation of Chicago’s iconic Willis Tower. The renovation will be the first since the 108-story tower was completed 43 years ago. 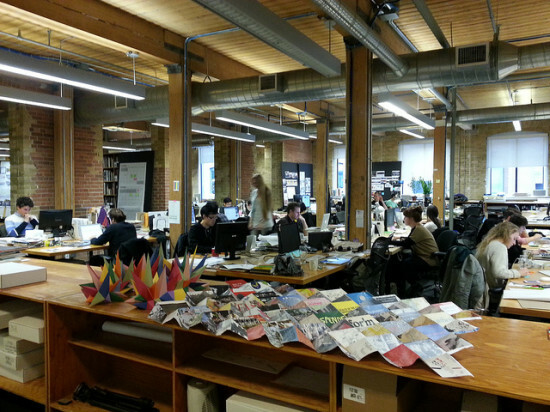 Gensler’s Chicago office is leading the design for the project, which is being initiated by Blackstone and Equity Office. The plan for the Willis Tower includes the transformation of approximately 460,000 square feet of the building’s interior and a completely new public experience at its base. New amenities to the tower will include a fitness center, tenant lounges, and private event space. The tower’s observation floor, Skydeck Chicago on the 103rd story, will also be remodeled. The base will include more than 300,000 square feet of new retail, dining, and entertainment spaces, and 30,000-square-foot outdoor deck and garden space. Included in the base's redevelopment is a three-story glass structure atop the building's plinth, as well as a three-story subterranean winter garden. “With this historic investment the Willis Tower will remain a vibrant and modern icon that inspires both young and old for generations to come,” Chicago Mayor Rahm Emanuel said during the announcement of the renovation. “But more than that—today Blackstone is doubling-down on its confidence in the future we are building in the city of Chicago.” Built in 1973, the Willis Tower was the tallest building in the world for nearly 25 years. It is still the second tallest in the United States, behind New York’s One World Trade Center. To achieve its immense height, architect Bruce Graham and engineer Fazlur Rahman Khan envisioned the building as nine square structural tubes. As part of the renovation announcement, Equity Office committed to offering 5,000 Skydeck tickets to Chicago Public School students. Equity Office will also donate $100,000 to Project Pipeline, a program sponsored by the Illinois chapter of the National Association of Minority Architects (I-NOMA). Project Pipeline’s goal is to educate and mentor minority students through the process of becoming licensed architects. The tower was renamed the Willis Tower in 2009. 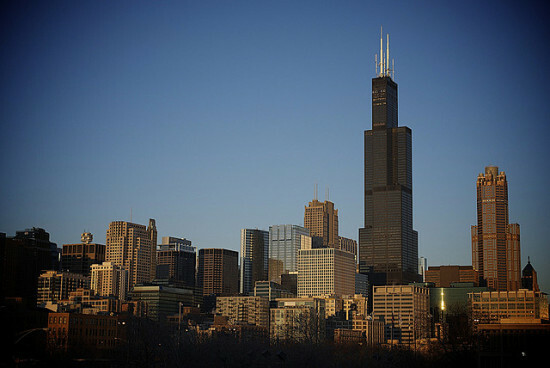 Many Chicagoans still refer to the building by its original name, the Sears Tower. Plans for 2,700 new homes along the Chicago River have some neighbors and realtors calling a long-vacant lot near the Willis Tower by a new name. 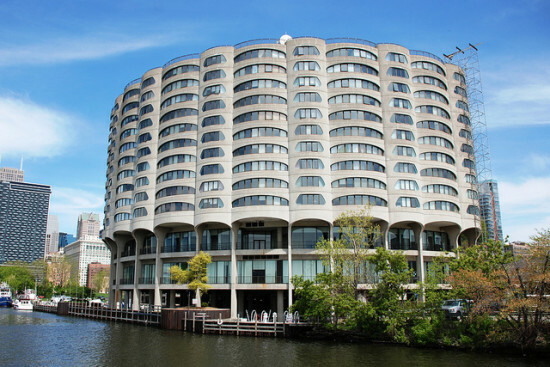 “River South” refers to a few sites, among them: a 7.3-acre riverside parcel between Harrison Street and the River City condo complex designed by Bertrand Goldberg. As Crain's Chicago Business reports, that's where developers CMK and Lend Lease are planning five towers with nearly 2,700 residential units, anchored by a 47-story building with 626 units. The developers tapped Perkins + Will principal Ralph Johnson to draft a master plan for the area. Whether or not the River South moniker sticks, the area has generated renewed interest from real estate watchers. Two other Chicago developers, D2 Realty and Phoenix Development Partners, have previously hinted at a large, mixed-use development on a 1.6 acre-parcel nearby. According to Crain's, developer Related Midwest is in talks to develop another 62-acre property at Roosevelt Road and the Chicago River. You can watch a video of the entire panel on Vimeo, and embedded here, in which we discussed how to encourage collaboration without embracing chaos. New details have emerged on New York’s latest, tallest, super-tall skyscraper—the Adrian Smith + Gordon Gill–designed tower rising on, where else, 57th Street. Real estate blog NY YIMBY has uncovered new drawings for 225 West 57th Street, which will rise to a height within one foot of One World Trade Center. 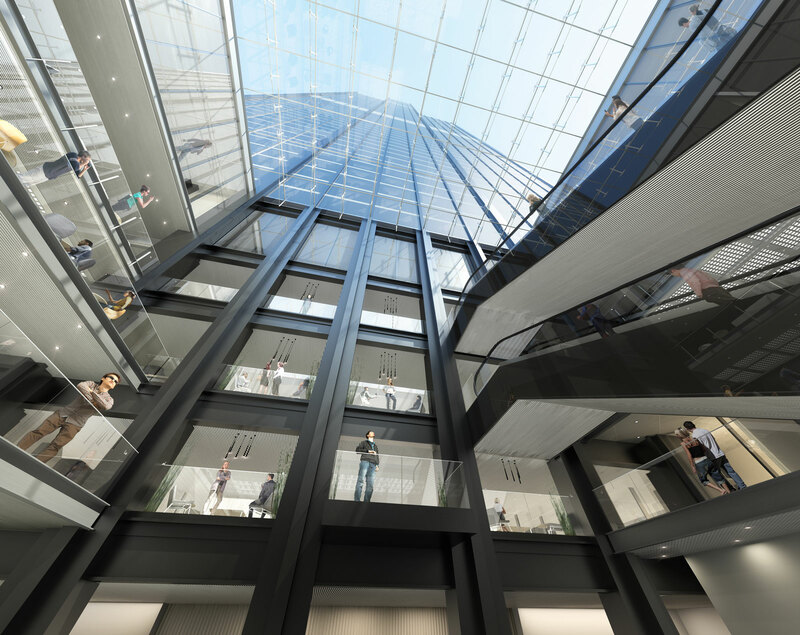 The 1,775-foot-tall tower, known as the Nordstrom Tower for the store that will anchor its base, will have a glass curtain wall accentuated by aluminum louvers and steel fins. There have been limited renderings for the project from the start, and the latest drawings only hint at what is next. 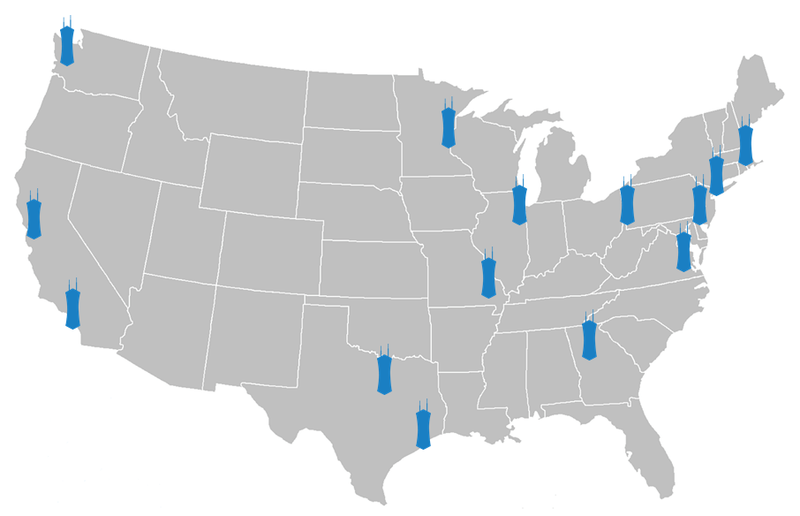 Here's what we do know: as noted by YIMBY, at its height, Nordstrom Tower has a higher roof than the Willis Tower in Chicago and is slated to become the tallest residential building… in the world. Kohn Pedersen Fox (KPF) is racking up an impressive collection of superlatives with a host of new glass towers in New York City. Of course there is Hudson Yards where a glossy KPF-designed building will become the tallest tower at the country's largest private development site, but that is just the start of it. 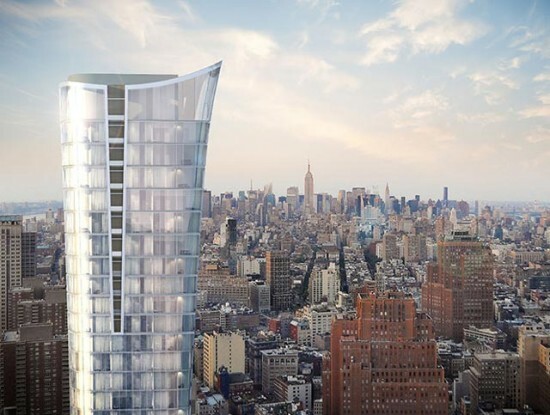 In April, renderings appeared for the firm’s 64-story, cantilevering glass tower in Gramercy. The structure, which has a multi-story masonry facade, reaches 777 feet, making it the tallest residential building between Midtown and Downtown. Unsurprisingly, 45 East 22nd Street is going condo. Moving right along to 101 Tribeca, another all-glass condo building. NY YIMBY reported that this tower, which houses 129 units, rises from a more narrow base and then curves its way up to a pinnacle at 950 feet. At that height, 101 becomes the tallest residential building in Lower Manhattan...for now. Now back to Hudson Yards for a moment. As KPF's 30 Hudson Yards rises to 1,227 feet and its more modest sibling, 10 Hudson Yards, climbs to a respectable 895, new renderings surfaced for 55 Hudson Yards. This tower, designed by KPF and Kevin Roche, is still glassy, but slightly less so thanks to a metallic grid that frames its 900 feet. According to the developer, Related, the 1.3-million-square-foot structure is inspired by early modernism and Soho commercial buildings. And then there is One Vanderbilt in Midtown. According to NY YIMBY, this glass giant reaches a pinnacle at 1,450 feet making it the second tallest tower in New York. But why stop there? If One Vandy gets approved to go just one foot higher it gains yet another superlative—topping Chicago's Willis Tower. And that, folks, makes it the second tallest tower in the Western Hemisphere. While not officially approved, the building has already become the glossy symbol of Midtown East Rezoning—a plan to upzone the area around Grand Central Terminal. That proposal died under Mayor Bloomberg, but has found new life under his successor. If the controversial rezoning ultimately does move forward, it likely won't take effect until 2016. Fear not One Vanderbilt, the city is expected to give this 1.6-million-square-foot tower a special permit to kick things off ahead of schedule. At first glance, the glass-observation boxes that jut out of the Willis Tower’s 103rd floor don’t look all that safe—and that is exactly the point. The SOM-designed attraction, known as the Ledge, opened in 2009 and offers “thrill seekers,” “death defiers,” and “people who can wait in a really long line” the chance to step outside of the iconic skyscraper and look straight down at the streets of Chicago, 1,353-feet below. The floor of the suspended structure is comprised of 1.5-inch laminated glass panels, which can hold 10,000 pounds and withstand four tons of pressure. So, the danger is all imagined, right? Well, it certainly didn't feel that way for a California family who visited last night. When Alejandro Garibay and some of his family members stepped onto one of the boxes, they noticed cracks on the glass floor, which, remember, is suspended 1,353 feet above ground. Garibay, told NBC 5 Chicago that it was a "crazy feeling and experience." You don't say! 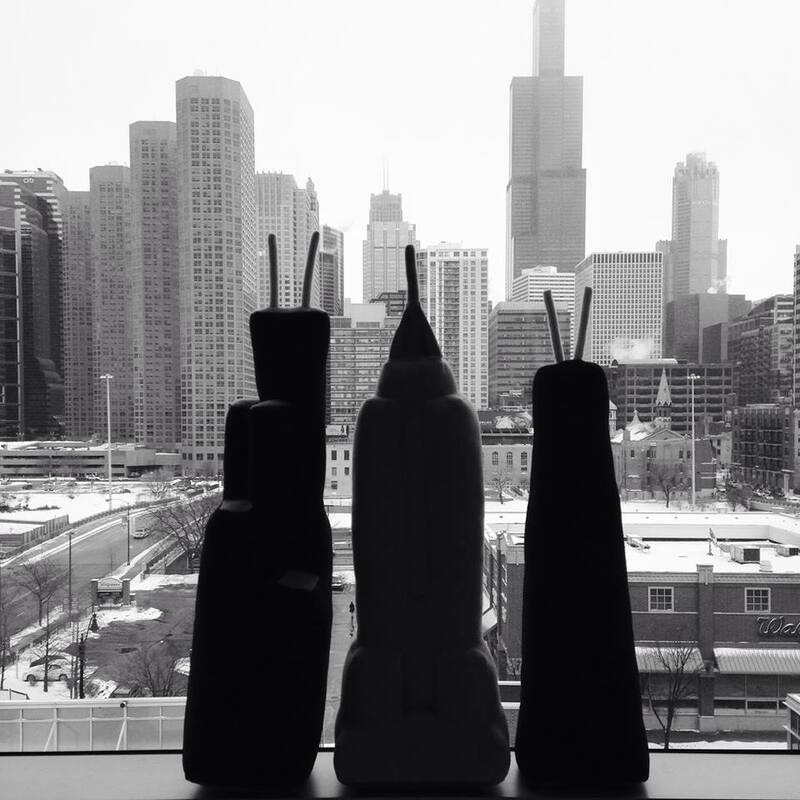 According to Bill Utter, a spokesperson for the Willis Tower, there was nothing to fear. 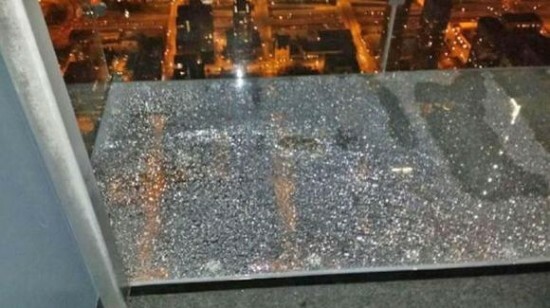 He told the Chicago Sun Times that it was only the coating that cracked and that the structural integrity of the Ledge was not impacted. 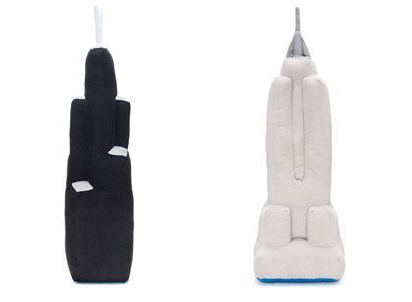 “Occasionally this happens, but that’s because we designed it this way,” he told the paper. “Whatever happened last night is a result of the protective coating doing what it’s designed to.” NBC 5 Chicago reports that the Ledge is closed today for what an official calls a "routine inspection." Move over, Willis Tower. The Council on Tall Buildings and Urban Habitat (CTBUH) issued its official ruling Tuesday: New York’s One World Trade Center unseats the Chicago skyscraper as the tallest building in the Western Hemisphere. 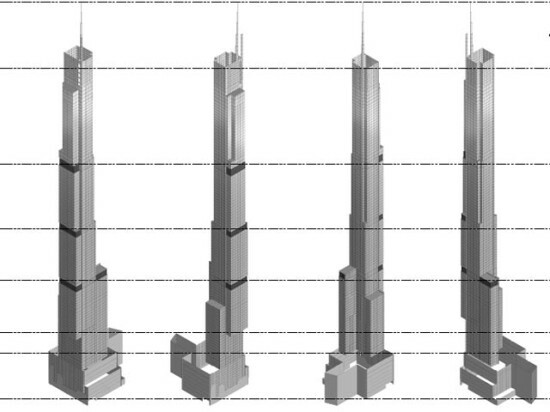 The new tower’s symbolic height of 1,776 feet was called into question when a design change suggested it might achieve that elevation only through the addition of a removable broadcast antenna. CTBUH counts only structural elements that are considered an integral part of the building’s aesthetic. It was designers Skidmore, Owings & Merrill’s assertion that 1 World Trade Center’s communications equipment represented a permanent architectural feature that persuaded CTBUH to affirm its height. The bottom point of the building was also in dispute. Without antennae, 1 World Trade Center is 1,368 feet tall — the height of the original World Trade Center tower destroyed in the 2001 terrorist attacks on Sept. 11. Chicago’s Willis Tower (also an SOM building), still commonly referred to as the Sears Tower, stands 1,451 feet tall — 1,729 feet tall with antennas. It was the tallest building in the world until 1996, when the Petronas Twin Towers in Kuala Lumpur, Malaysia, won CTBUH’s recognition. High up. The New York Times' Edward Rothstein went out on a ledge for the paper today. 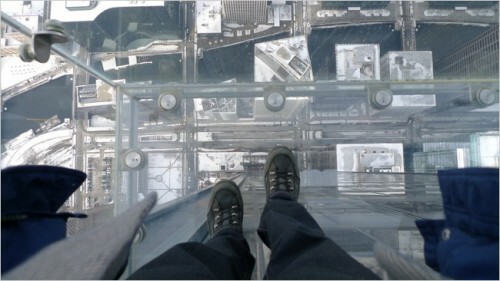 The critic took on the glass boxes that protrude from the Willis Tower in Chicago known appropriately as the Ledge. The critic waxes poetic about the vulnerability of the city and the fully human sensations that occur when floating some 1,353 feet above the street. He also takes the opportunity to point out the redundancy of the Ledge's cousin, the Grand Canyon Skywalk. Tear Down. Christopher Hawthorne balked at SFMOMA's public relations campaign to portray the museum's new Snøhetta-designed wing as a wallflower respecting its Mario Botta-designed neighbor. But as Hawthorne points out in the LA Times, the new building is anything but quiet. Rather it's more a "chiseled behemoth." Hawthorne finds the museum's affront to its Botta as part of a larger trend in the American museum world where the tendency is to drop good, but alas, old architecture in lieu of ever newer names and trends. Read: Whitney, MoMA, Barnes, to name but a few. Put a Lid on It. In a totally biased and unabashedly opinionated piece for City Watch, Jack Humphreville writes that a back room deal may have LA ratepayers of the Department of Water and Power footing the bill for a new twelve-acre park designed to cap the underground reservoir replacing the Elysian Reservoir. Humprhies argues that the $85 million park should fall under the auspices of the City and the Department of Recreation and Parks. Manhattanhenge. Gothamist reminds us that tonight at 8:17PM the full sun will set in perfect alignment with east west axis of Manhattan's street grid. Remember not to stare, mesmerized, for too long. In our pilot Midwest issue, I wrote about The Ledge, a new viewing platform at the Sears Tower (now Willis Tower) in Chicago. At the time, only renderings were available of the SOM-designed all-glass cubes that protrude off of the tower's west face, and the project was expected to open in mid June. Well, it appears that the dizzying new viewing experience is now accepting visitors, as a whole rash of pictures have popped up on flickr. Among them is the above image, which reminds us that sometimes the highest achievement that architecture can aspire to is to fuel the dreams of a child.